The following pictures appear, left to right, top to bottom, in the order they were taken during totality. All were taken with a Nikkormat mechanical camera and 500mm Reflex-Nikkor fixed aperture f/8 catadioptric "mirror lens" on a single roll of 35mm Kodachrome 64 colour slide film. 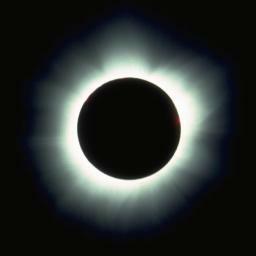 The film was removed from the camera immediately after the end of totality and brought back to Switzerland where it was processed the following week by the Kodak laboratory in Lausanne. Astronomical photographs usually lack clearly-defined frame boundaries, so it's risky to rely on the photo lab to cut and mount individual slides; I requested the processed film be returned uncut and unmounted. I examined the film roll on a light table, cut out the individual frames, and inserted them in plastic slide mounts. I inspected each of the 37 resulting slides (hey--Kodak always gives you a little extra film on the roll and during a solar eclipse, who's counting?) on the light table with a 10 power magnifier and chose 12 of the best images representative of the phenomena visible in totality to present here. These images were transferred to a Photo CD, with each slide scanned at 3072×2048 pixel resolution. I cropped to the portion of each scanned image containing the Sun, creating the high resolution images linked to this gallery. Medium resolution images of 640×640 pixels and the 256×256 pixel index images for this page were generated by scaling the original full resolution scans. I took these shots with essentially the same technique I used to photograph the 1999 eclipse. 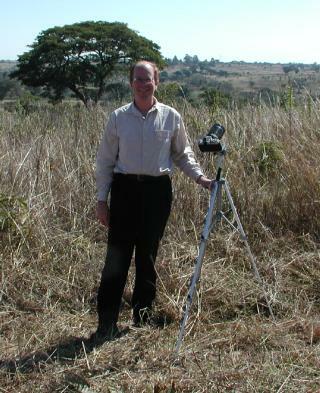 Immediately upon arrival at the observing site, I set up a collapsible aluminium tripod and mounted the camera and lens on it. This permitted the lens to equilibrate to the ambient temperature during the partial phase of the eclipse, eliminating the risk of thermal focus shift which can occur with long focal length mirror lenses. In the last minutes before totality I removed the lens cap (while shadowing the lens by standing in front of it--even a slender crescent sun may incinerate your camera's shutter curtain) and placed an Orion full-aperture aluminised glass solar filter over the lens. This permitted me to safely frame the sun in the viewfinder (allowing for the apparent motion of the Sun during totality), and fine-focus the lens. This way, there was no need to waste a moment of totality looking through the viewfinder--when the lights went out, the camera was already aimed and focused. 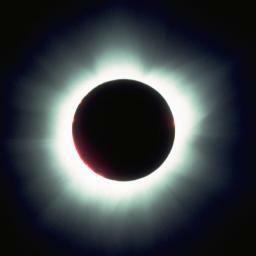 The range of light intensity of the eclipsed Sun far exceeds what can be captured on film. An exposure which shows the prominences erupting around the disc of the Sun will capture none of the coronal streamers extending several solar radii, while a long exposure which reveals them will hopelessly overexpose the inner corona. The only option, then, is to take a sequence of exposures ranging from very short to very long, each capturing different aspects of the eclipsed Sun. At the start of totality there may be a tiny sliver of the photosphere still visible (a diamond ring or Bailly's beads), so it's best to begin with shorter exposures. I set the shutter to 1/1000 second before the start of totality. 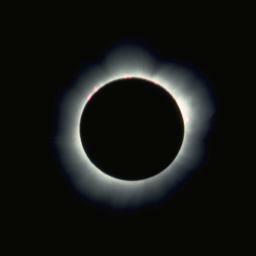 Once totality began, I simply tripped the shutter (using a cable release to avoid vibration), advanced the film, then set the shutter speed to the next longer interval. After waiting a couple of seconds for vibration to damp out, I took the next shot, and so on..."lather, rinse, repeat". A Nikkormat has 12 shutter speeds ranging from 1/1000 second to 1 second, plus "B", where the shutter remains open as long as the shutter release is depressed. I cycled through each speed in succession, holding the release for about three seconds upon reaching "B", then progressed back toward the shorter exposures. Upon reaching 1/1000 again, I made a limited excursion toward longer exposures, then headed back toward the short end in the hope of arriving there at the end of totality, which I was lucky enough to accomplish. 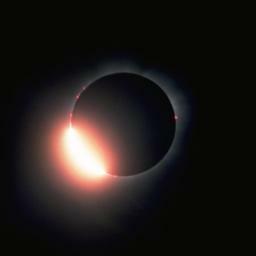 Now the sweet thing about this photographic technique is that with a totally mechanical camera like a Nikkormat and sufficient practice, you can do it entirely by touch--you needn't forfeit a millisecond of "eyeball time" during totality, yet you still take home a roll full of photographs. In fact, between exposures, there's plenty of time to observe the Sun with binoculars, check out the spectrum of the corona with a diffraction grating, search for stars and planets in the sky, look for the arrival and departure of the Moon's shadow, or check for shadow bands at the start and end of totality. 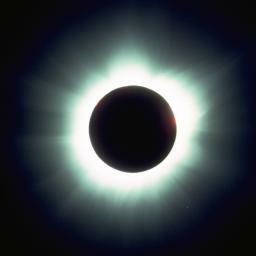 This 1/1000 second exposure was taken an instant after the second contact (the start of totality). The Moon is moving from lower left to upper right across the face of the Sun; the initial diamond ring at the 1 o'clock position is just disappearing. Prominences are visible at the 3 and 10 o'clock positions and all around the large active region at the upper right. 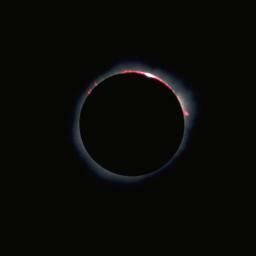 A 1/125 second exposure captures prominences and the inner corona simultaneously. Note how the corona is particularly intense above the active region at the upper right, forming the base of a coronal brush visible in longer exposures. In this 1/15 second exposure the intense inner corona washes out the prominences except for just a hint at the 3 and 10 o'clock positions where the characteristic red hydrogen alpha prominence colour bleeds onto the black disc of the Moon. The bases of coronal streamers are evident around the disc; look at that beautiful double streamer just below the 9 o'clock position. A 1/4 second exposure begins to give a hint of the extent of the coronal streamers visible to the eye. The green cast of the corona is due to ionised atoms of iron which emit light in the green portion of the spectrum (principally the 530.3 nm forbidden line of Fe XIV). Doubling the exposure to half a second further enhances the streamers and some of the filamentary structure of the corona, particularly near the active region at the top right. The white light which predominates in the inner corona is principally due to light from the photosphere scattered by free electrons stripped from ionised atoms in the corona, where the temperature exceeds one million degrees Kelvin. In the outer corona, light scattered by interplanetary dust also contributes to the continuum emission. This dust pervades the solar system along the plane of the ecliptic to beyond the Earth's orbit and can be seen as the zodiacal light after sunset and before dawn (in a dark and transparent sky). This shorter exposure, taken around mid-eclipse, shows additional detail of coronal filaments and streamers. Halving the exposure time shows streamers closer to the Sun. The human eye perceives a far greater range of intensity than photographic film. 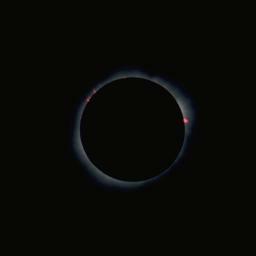 All of the phenomena which require separate exposures to highlight--prominences, streamers, inner and outer corona--are visible all at once when you observe an eclipse in person. That's why folks are willing to journey to the ends of the Earth to see one. This 1/1000 second exposure was taken at mid-totality. The Moon, moving from lower left to upper right, has now occluded the red hydrogen alpha emission from the active region at the upper right. The large eruptive prominence at the 3 o'clock position is still very much in evidence. The motion of the Moon across the face of the Sun is evident when comparing this 1/1000 second shot taken 2/3 of the way through totality to the previous image from the half way point. The Moon has begun to block the prominence at the right and is revealing prominences at the lower left previously hidden behind the Moon's limb. 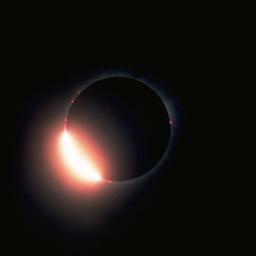 This medium length exposure was taken in the last few seconds before third contact--the end of totality. The red glare from prominences at the lower left is clearly visible even through the overexposed glare of the inner corona. Third contact ushered in a beautiful diamond ring effect. This 1/500 second exposure shows the (overexposed) photosphere emerging at the lower left as the Moon uncovers the face of the Sun. 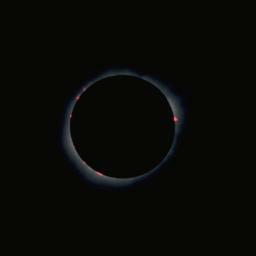 Even at this moment, the inner corona and prominences remain visible to the camera, although the dazzle of the diamond ring hides them from visual observers (who must, in any case, avert their eyes or use a safe solar filter from the instant totality ends). I couldn't believe my good luck to have the shutter set to an appropriately short exposure at the moment the diamond ring occurred, and I was luckier still to be able to get a second shot of the diamond ring at 1/1000 second (on frame 37 of a 36 exposure roll of film, no less!). The emerging Sun, while still overexposed, is less so, revealing the red chromosphere around the limb of the Sun as the Moon uncovers it. This composite image approximates the visual appearance of the eclipsed Sun by summing a selection of images featuring phenomena visible simultaneously to the human eye. Superimposed on the Moon's disc is an image of the Sun taken within half an hour of totality in Zambia by the SOHO spacecraft 1.5 million kilometres sunward of the Earth. For details please refer to the Production Notes for this image.